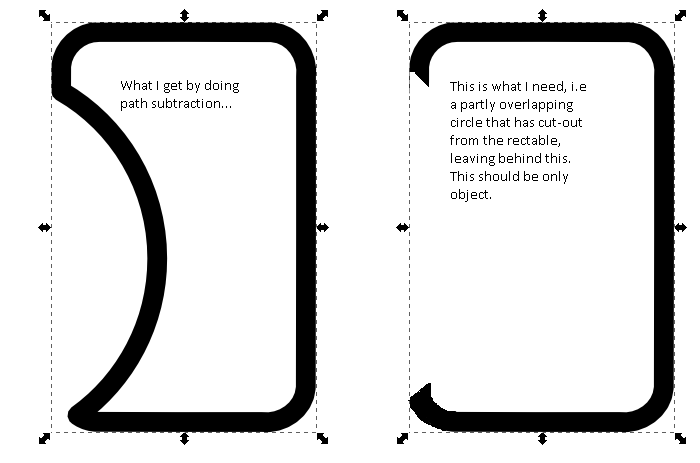 I would like to remove (like in cut away) a circular portion from a rectangle, leaving an open object. Tried using the Path > Difference tool, but it results in a closed object. Attached image (screen shot from Inkscape, edited in MS-Paint so looks bit crude), explains what I am trying to achieve. You probably just have to "convert path to object" (Ctrl-Alt-C) before the substraction. Create a shape that overlaps all of your object except the parts you want to cut out. Select both your object and the clip shape, and then select Object → Clip → Set from the menu. 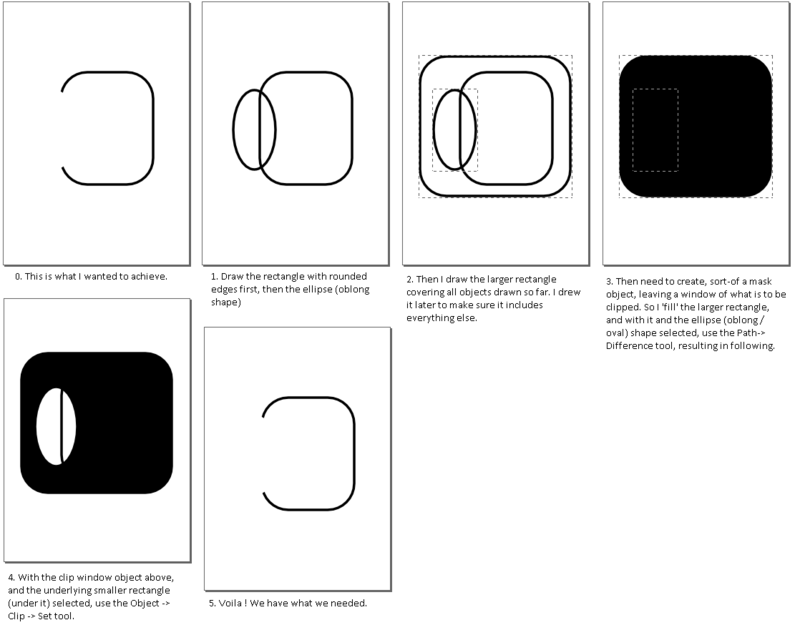 In the illustration above, the middle image shows the object to be clipped (green rounded rectangle) and the clip shape (translucent square with a hole cut in it, created using Path → Difference from the square and the circle in the image on the left), while the image on the right shows the resulting clipped shape. You can also use the same method to clip more complex objects, including groups and bitmap images. Note that I have already accepted an answer (that was short and simple), but I am adding this answer to explain/elaborate the alternative method proposed by @IlmariKaronen, visually s.t. newbies (like me), find it easier to comprehend. I am certain that this method can be useful and productive in few scenarios... All credits due to him.